I am excited to share something I am making for an upcoming Christmas party I will be attending. I am crafting them for center pieces for the tables. Isn't it sweet (in more ways than one)!! It is a paper mug filled with yummy chocolates. It is so festive and I think it is going to look great on the tables. Here is a close up of just the mug. I filled it with shredded kraft paper and added a snowflake embellishment to the front. This is what is inside the mug. I wrapped up some delicious chocolates in snowflake cello wrap and tied it tight with red & white bakers twine. I think this would make a great little Christmas gift for a teacher, friend, neighbour, hairdresser, mailman, etc. I am definitely going to be making more. I would be happy to make some up for you to give to your family and friends. If you are interested, you can email me at scissorsandtrimmers@gmail.com for details. Meet Jama - TSF Around the World Online Crop! Welcome to the Around The World Online Crop with Two Scrapbook Friends! There are great challenges and prizes to be won, so I hope you will join in the fun and play along. You can get all the details about the online crop at the Two Scrapbook Friends blog. Click here! My challenge is to incorporate 'animals from around the world' in your project. Many of us visit the zoo over the summer months, or maybe you spent the day at African Lion Safari. One of our local parks has animals that originate from different parts of the world. Who knows, maybe your pet has a worldly history? Whatever the case, use these as the topic and insiration for your project. I am going to inspire you with a layout that I created around a North Chinese leopard from the San Diego Zoo. His name is Jama! He was born at a zoo in Germany in 1993 and I had the pleasure of meeting him in 2012. To mat the main photo of my layout, I created a file folder using my Silhouette. I used the tab to display his name using mini alphabet stickers. I created a little cluster of paper and stickers in the top right corner of my page to give my page a little dimension because the design on the paper itself is very flat. I even managed to find some leopard paper. I added a second photo of Jama to show the front of his very handsome face. I found a sticker in my sticker bin that matched and helped create a little more dimension to balance my page. My favourite part of my layout is the journaling. I used a new font and my Silhouette Sketch Pens. It took a little patience to set it up but I am very impressed with the results. I also added some footprints around my page using a stamp. They are subtle and blend in with the background. 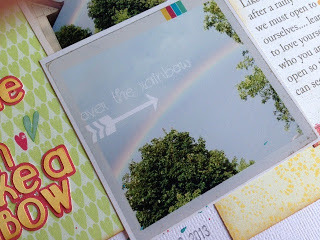 Be sure to pop over to the Two Scrapbook Friends blog and get all the details for this awesome online crop and join in. 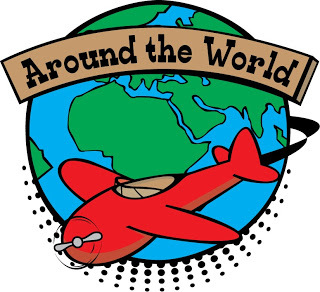 Around The World Online Crop With Two Scrapbook Friends! 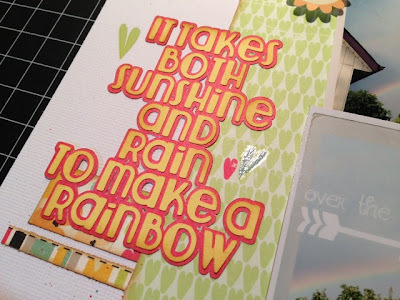 Please join us over at the Two Scrapbook Friends forum and blog to be inspired and connect with other scrappers at our Around The World Online Crop September 20th at 3pm! Our Designers and Joanne & Carolyn (that's me) will be issuing creative World inspired challenges to get your creativity going! There will also be games to play and prizes to be won. I hope you will join us and be inspired, I look forward to seeing your creations! 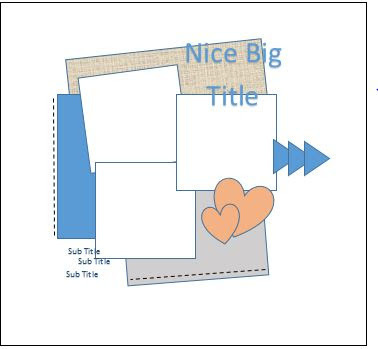 Check back on the Two Scrapbook Friends blog and forum on Friday, September 20th to see all the challenges and inspiration from our Design Team. Today is another Little Red Wagon challenge, and I am the hostess! 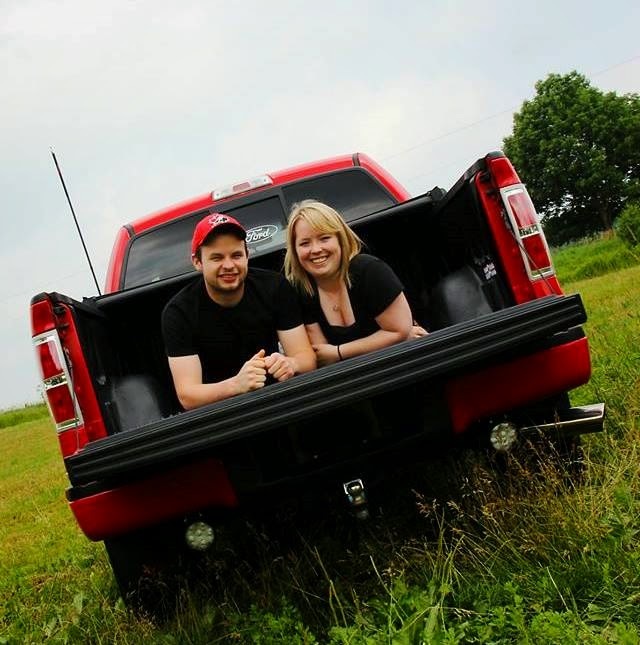 My challenge is to use only red & white on your project....to celebrate Canada Day! Here is the card that I made! I am working with very few supplies because everything is packed up (we are moving in less than 2 weeks). It was a bit challenging, but I pulled it off! I have not....and will not be packing up my Silhouette until the day we move so I pulled out my red pen and drew my sentiment in the bottom right corner. 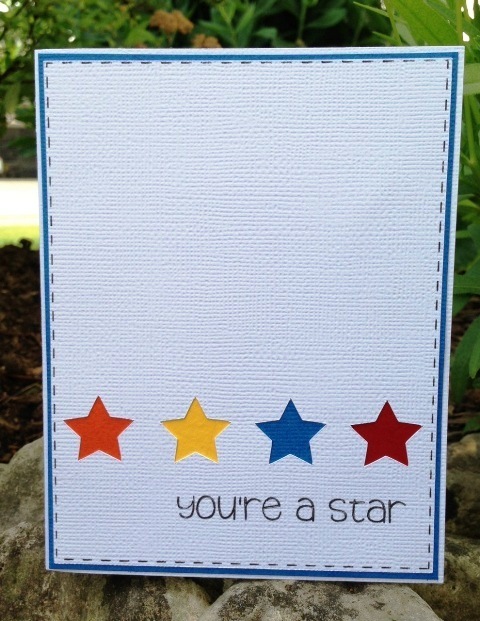 I found an old template that had stars on it, so I traced the pattern on my cardstock and then stitched with red floss! I had white cardstock and a scrap of red checked paper that matched the floss and ink colour.........PRESTO! I hope you will have a chance to play along this week and join in the fun. 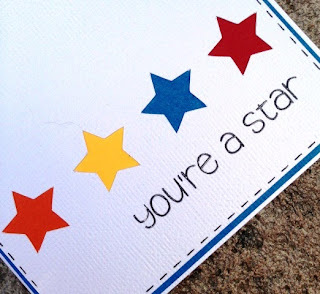 Also, be sure to visit the Little Red Wagon blog and link up your creation. While you are there, be sure to check out what the other girls have been up to! What a beautiful Wednesday!!! I am in such a good mood today. The sun is shining and we have SOLD our house (in only 2 days)!! We are scheduled to move into our new house in Elora on July 8th, which means that we have lots and lots of packing to do. 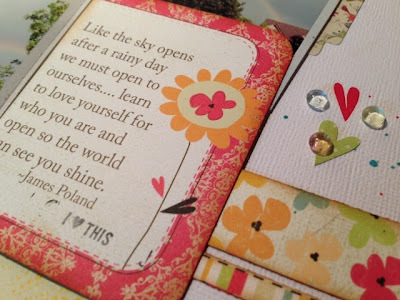 I am starting to pack up most of my scrapbooking supplies, so I am going to be limited on what I can create. I am going to try and focus on Jay's travel book (although I might slip in something different too). I decided to make another 'albums made easy' style layout to finish off the Santa Monica Pier. 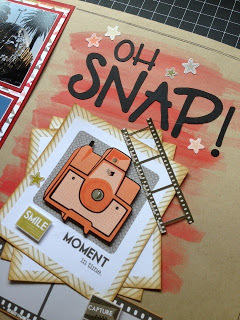 I just love this style of scrapbooking. It is fun, easy and really makes me feel like I am getting somewhere with this project. There are definitely more than 3 different patterned papers on my pages, plus I was able to use up lots of little items I had in my stash. I found this 'road trip' sign and a curly arrow....along with this chipboard word that said 'GO'. I arranged them in the first slot to set the tone for my spread. 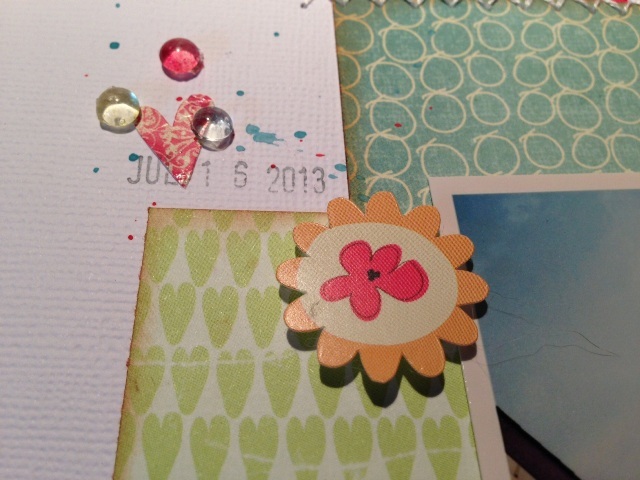 I used photos that really stood out from the day and tried to pair them up with appropriate embellishments. Look at this cool, lazy dog laying around on the pier. You couldn't help but smile and he certainly was resting and relaxed. Here are the handsome tourists posing for a photo with the ocean and mountains in the background. I used stickers to personalize a few spots.....a super easy way of journaling the day. I had one photo left over from a previous layout that I did just focusing on this very LARGE snake that Jay and David spent some time with. I included it on this page to recap the highlights of the day. Thanks for stopping by and visiting! 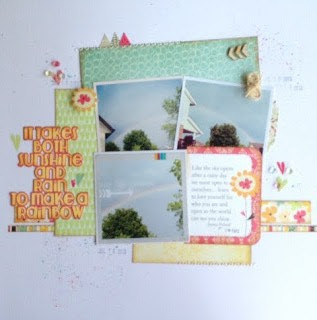 I hope you will check out the Little Red Wagon blog and play along with this weeks challenge. Don't forget to link up your project so we can all see what you have created. It's Wednesday and I am excited to share a layout (yes, you read that correctly) that I made for the challenge for Little Red Wagon this week. Regan challenged us to use metal on our project and I decided it was time for another layout for Jay's California album. With all the work we have been doing around our house to get it listed for sale, I really haven't had time to play with my scrapbooking stuff. I found a similar layout on Pinterest so I used it as my starting point and added my own touches to make it my own. I used a metal clip from Basic Grey's Hipster collection as my metal accent. I love how my page turned out and it felt great to create something. 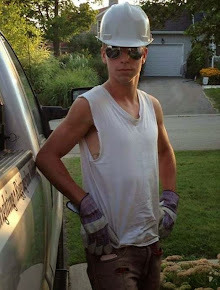 I hope you will take some time to play along. 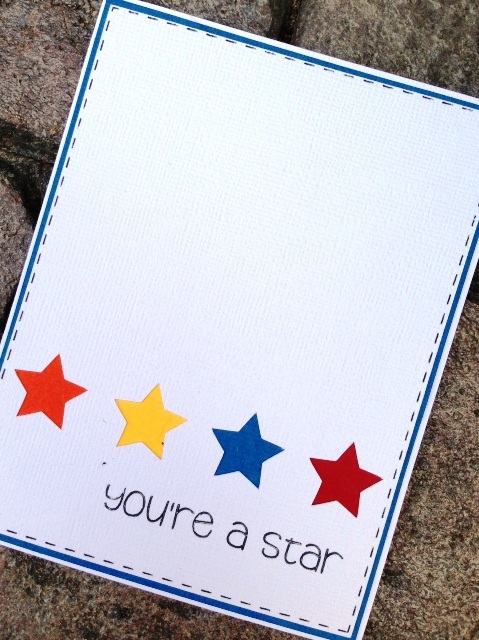 Make sure you link up your creation on the Little Red Wagon blog. It's Wednesday and that means that there is another challenge up at Little Red Wagon!! Sorry I am a bit late.....but better late than never, right? This week's challenge is to use cork. I had a sheet of cork in my stash and I was happy to give it a home. I was in a bit of a rush this week so I visited Pinterest and cased this card. In my rush to get the card done I forgot to get the link to the creator's blog (oops)! I can't take full credit for this one, but I did make a few changes to make it my own. I hope you play along with the challenge this week and visit the Little Red Wagon blog for some inspiration.